Pyrrhopappus grandiflorus (Nutt. ) Nutt. Leaves: In basal rosette, simple, spatulate to oblanceolate in outline, 3 to 7 inches long, 1 to 1.5 inch wide, pinnately divided to deeply toothed, loosely hairy or nearly glabrous. Inflorescences: Heads, solitary, terminal, on upright flowering stalks that are leafless or occasionally with 1 to few leaf-like bracts; heads 1 to 2 inches wide; bracts generally 13 or 21, linear, about 3/4 inch long. 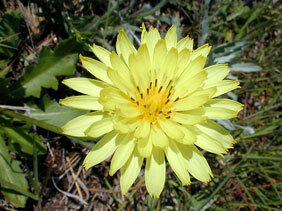 Flowers: Ray-like florets, 45-100, yellow, tips 5-toothed, anther tubes conspicuous, dark. Fruits: Achenes, about 1/2 inch long, 5-ribbed, beaked, tipped with many, off-white to beige, hair-like bristles, enclosing small seed. Habitat: Open disturbed areas, pastures, and roadsides, most abundant in clay or sandy soils. Distribution: Principally central 1/3 of Kansas. Comments: False dandelion produces a spherical tuber 2 to 4 inches below the surface of the ground. The basal rosette of leaves resembles that of the common dandelion (Taraxacum officinale ).